The difficulty with verbal language for many children with language disorders is that it is fleeting and invisible. Communication boards make that language visual, permanent, and give clear delineations between different words. My students with low language skills need as many cues as possible. Modeling language with communication boards and books make understanding language an easier task. My jaw dropped the day that I first saw a minimally verbal student follow my example and point to words on his communication board. Then when he added his tiny voice to his pointing, the tears welled up. I had only been modeling language with the communication board for 15 minutes, but his brain was ready for this next step and he leaped! That was an emotional moment. And I have had several more like that over the years. Speak slowly. Never speak faster than you can point to words. Students need time to process the visual and verbal cues that you are giving them. Use core vocabulary from the book. When possible, use the pronouns, verbs, and adjectives on your main page. I will often alter my directions or readings to have core words better represented. Using your main words over and over will help your students retain and use these words themselves. Use familiar fringe vocabulary. There are thousands of possible fringe vocabulary words, but your goal is to highlight the most important words. Use the words that are familiar in your student’s environment. Help your student use the communication book. Use models, prompts, and/or hand over hand assistance to help students point to words as you say them. Make the communication flip books available at all times. No one learns a language when they are only exposed to it for a few minutes once or twice a week. Children need constant modeling by adults and peers throughout the day. Don’t be afraid to use some words that aren’t in the book. Many words that we use in speech are not core vocabulary. Articles, conjunctions, and “to be” verbs are used throughout our verbal speech but are not beginning words for communicators. Don’t make your verbal language ungrammatical or robotic in an attempt to only use words in the book. 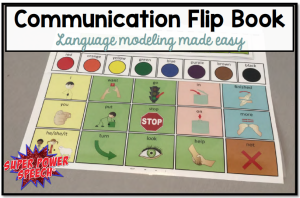 Make a video of how to use the communication flip book and share it with teachers and family. Most adults are not familiar with how to use the book and need to be taught. They also need to “buy in” to the book’s purpose so that they will be more likely to use it. 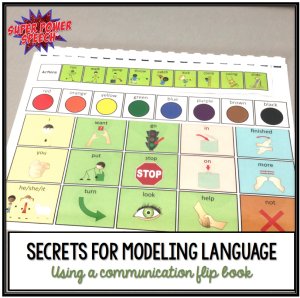 Looking for a great communication flip book, check this one out! My daughter and I set up a role play situation of modeling language. Check out this video of my daughter and I practicing language modeling. Also make sure to enroll in my free e-course to get four video modeling scenarios and more great content delivered straight to your inbox! Subscribe at the end of this blog post. Looking for a great communication flip book? I think I’ve tried almost every single communication book out there. I’ve spent time creating photo album communication books, tri-folds, multiple page Velcro books, PODD books. The list goes on and on. Many of these boards and books I have spent hours creating, only to abandon after a few weeks because they are too big, too small, don’t have the right fringe vocabulary, or just aren’t working. Last year, I tried a different approach. I made a communication flip book with core vocabulary on the main page, and fringe vocabulary on top. My most frequent fringe vocabulary was actually attached to the board. The rest was actually placed on the toy bins to which they referred. See my post here for details. After using this system for several months, I realized that this method actually worked for me! It was light weight, contained all the main vocabulary that I needed, and kept me organized for many activities. I wrote a post about how to make your own flip books. However, after multiple inquiries, I decided to make one for you! The pictures represent core vocabulary for AAC users including pronouns, actions, and several descriptors. The words are colored using the Modified Fitzgerald color coding system (pronouns = yellow, verbs = green, adjectives = blue, etc.). There are 16 strips of fringe vocabulary including actions, descriptors, prepositions, school words, art activities, and some play activities. The best part about these communication flip books is how customizable they are! You can add and subtract core vocabulary easily and flip through pages with ease! Please watch the video that I made describing the steps to make your communication flip book! Get a copy of your own Communication Flip Book by clicking here! Love this!! So helpful! Videos were especially helpful 🙂 I’m fairly new (just finishing my CF) so I don’t have any memories.. yet. I’m glad the videos were helpful! I”m putting together a free email course right now on using communication boards! I would love to know more about the course, how does it work? Information will be posted 4/11. I love the organization and thought behind this. I try to use aided language boards for each activity, but I love having it all in one place and just changing out the fringe. Without seeing it up close I was wondering if it would be appropriate for preschoolers. I have a whole classroom of nonverbal/ unintelligible 3 year olds where I would love to implement this. Yes! These are perfect for preschool kids. I’m making a free e-course on how to use communication boards in more situations and they are ideal for preschool! I watched your assembly video, but was wondering if you have any ideas or tips to “tab” the fringe boards for quicker access. I thought about leaving tabs cut in the laminate, but any other ideas welcomed! If you consider revisions, a label on the bottom of each fringe spaced differently on each would be great, 🙂 but it is really attractive and love the fringe boards you designed! Sorry! I wish I could make all of my paper bigger and make it work! I love your idea about the ABC board on the back and leaving the fringe around the room on the activities. Core communication boards are a huge part of my pracrise and its always a balancing act trying to make a board or book portible while still providing lots if vocabulary options and thus it not being too small. Are you using these as a low tech communication system or as a visule support to scafold modelling opportunities? I have a quick question. Why did you choose to switch from Boardmaker pics to non-boardmaker? Just curious… I just bought the communication book and was surprised to see different images. I am sure you had a great reason. Thanks kindly for the continued lessons and support! Easy answer. Mayer Johnson does not allow people to use their images in paid or free products when they are in pdf. That is why it took me so long to create a communication book to sell, because I needed to buy another symbol set that allows for commercial use. I knew you had a good reason! Thanks for the creating such a great tool/book… I am looking forward to making this over the break. Thanks for clarifying! This was my question too. I just purchased this from your TPT store. Also, I really love that you added a blank page in power point to the purchase! I may be adding my own Meyer Johnson pics to that one while keeping your template/ Fitzgerald key to help my kids who may be transitioning to apps using Meyer Johnson symbols in the future. This is an excellent resource! Thank you! I would like to purchase the books you have made or the ability to print and make by own. These are the I can (hand verbs) plus the others. Where can I get these? Just found this post on pinterest. THANK YOU, super helpful and generous. The videos make a big difference. Found this gem again and was happy to reread! My favorite memory is seeing a child go back to the preschool class and use something that we had just practiced! I Love this Low Tech AAC Book!! I use if daily! !